Capcom, a leading worldwide developer and publisher of video games announced that it will be bringing four Capcom arcade favorites to iOS and Android devices. The titles include 1942 Mobile, Ghosts‘N Goblins™Mobile, Ghouls’N Ghosts™Mobile and Wolf of the Battlefield: Commando Mobile. Each of these games maintains fidelity to the originals, while offering players the option to play in modes that take full advantage of touch screen devices. In addition to Classic and Casual modes of play several of the games offer control options such as auto-fire and different button arrangements. Each game will also feature leaderboards so players can see how their skills compare against players from around the globe. All four games are expected to be available within the next few months. 1942 Mobile – This vertically scrolling shoot 'em up tasks players with battling through the entire enemy fleet. Shoot down enemy planes, avoid enemy fire and perform rolls and loops to avoid certain death in this epic retro nail-biter. Ghosts‘N Goblins™Mobile - Return to the days of yesteryear in this famously difficult action-platformer. As Sir Arthur, you must battle against demons and undead in order to rescue the princess Prin-Prin. 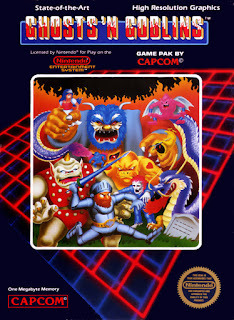 Ghouls’N Ghosts™ Mobile - Better, bigger and more beloved, this legendary side scrolling platformer pick up where Ghost ‘n Goblins ends. Wolf of the Battlefield: Commando Mobile - Armed with a sub-machine gun and a limited supply hand grenades, players battle through legions of enemy troops in this classic vertical scrolling shooter. Capcom Mobile is a wholly owned subsidiary of Capcom Co., Ltd. Our company is dedicated to bringing the amazing characters, stories and experiences of Capcom to a new generation of mobile players everywhere. Capcom was founded in 1983, and is responsible for some of the most celebrated franchises in gaming including Resident Evil®, Street Fighter®, Monster Hunter®, Ace Attorney®, Mega Man® and Devil May Cry®.